Prepare your own ground meat and sausage at home. Grinds up to 2 lbs. of meat per minute with its powerful 250W motor. The #5 die-cast metal head, feed neck, and auger easily grind heavy loads. The 0.5", 0.75", and 0.88" stuffing tubes produce a variety of sausage sizes. Grinder automatically switches off during a jam. 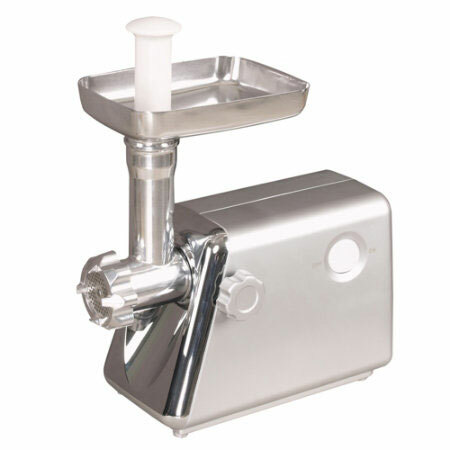 Includes stainless-steel cutting knife and plates, stuffing plate, stuffing tubes, receiving tray, and meat stomper. UL-listed. 14.58"H x 7.09"W x 13.79"D. One-year warranty.